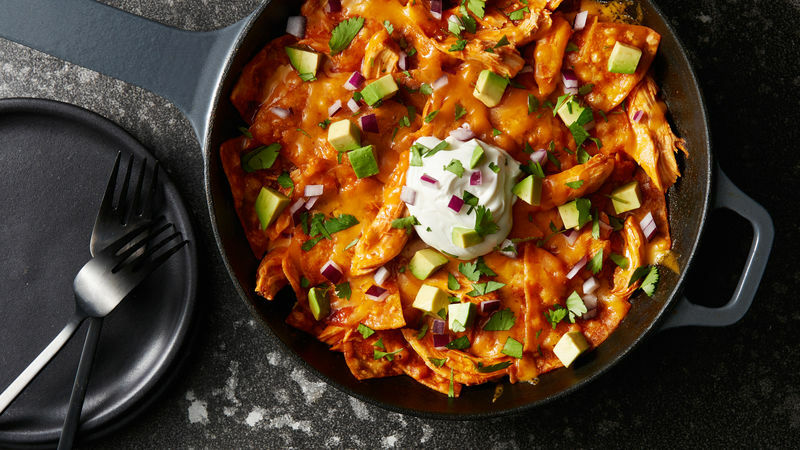 In 10-inch nonstick skillet, cook enchilada and chicken over medium heat 2 to 3 minutes, stirring occasionally, until hot. Add chips; cook and stir until chips are completely coated in sauce and slightly softened, 1 to 2 minutes. Sprinkle cheese over top; cover and cook 2 to 3 minutes or until cheese is melted. Garnish with remaining ingredients, and serve immediately. Look for chips that are on the thick side. Thin chips will break up too much in the cooking process and may become mushy. If you like it hot, finely chop a jalapeño or serrano chile, seeds removed, and serve as an added garnish.